Gah! Spied these darlings on Pinterest and was immediately transported to childhood. How adorable! Remember getting these McDonald’s gift certificates in my Halloween bag. Oh, for a hot caramel sundae right now! The sweet taste of Halloweens past! We are as obsessed with oven-baked tacos and Rick Bayless’ sauce as we are with Halloween! 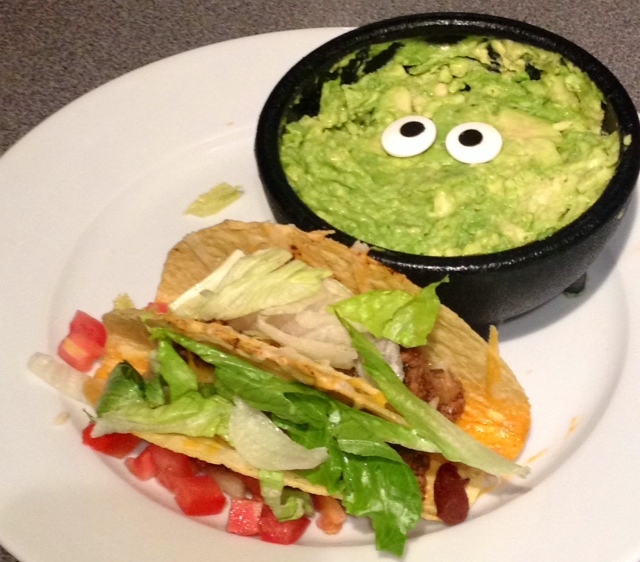 It was only a matter of time before our October menu merged with taco night! We snapped up two sizes of silly candy eyes and are happy to have found a use for them. 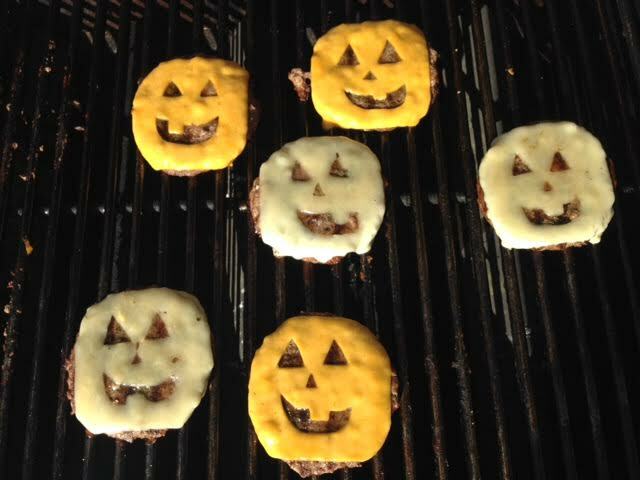 Cheerful and cheesy Tex Mex or Mexican doesn’t typically land on our silly Halloween menu radar. But it’s hard to ignore Mexican hot chocolate laden with cinnamon, vanilla and chilies, or pepita, lime and cumin pesto, or even spooky mole sauce. Many thanks to Sharon, who kindly took the time to scan and send us some ancient 80s Seventeen pages. The original looks like it came from a 1956 Pillsbury bake-off. And here’s a peanut butter version. 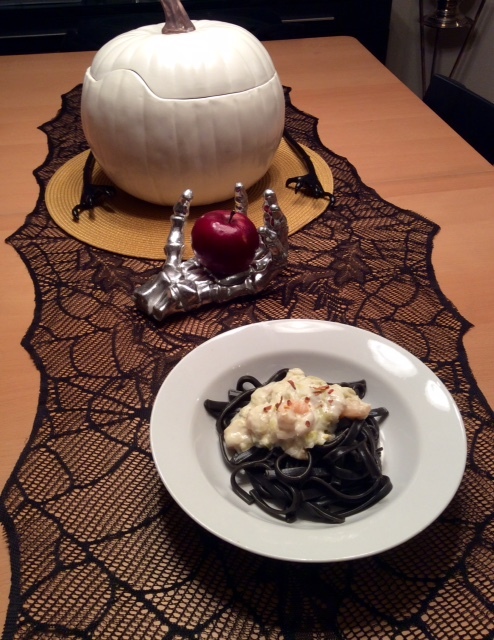 Another year, and another spooky Halloween pasta. 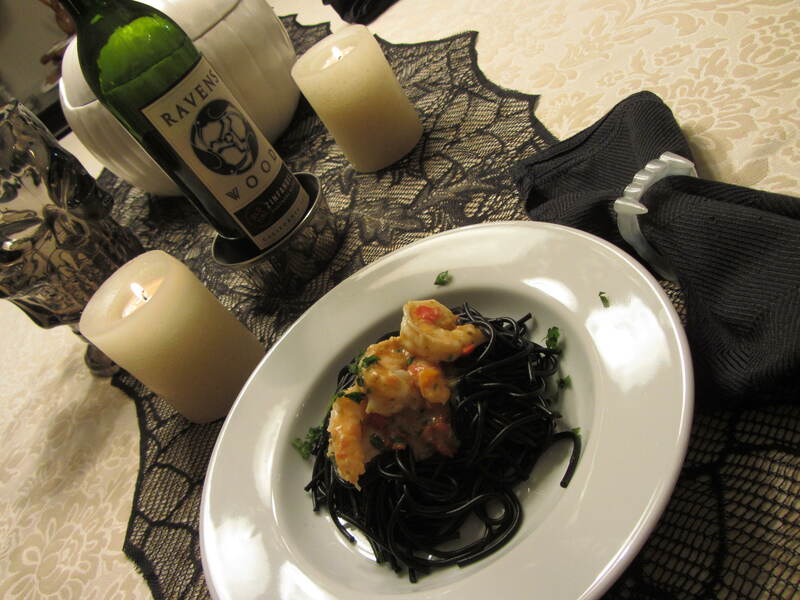 This year, we tried a lemon shrimp version. Simple and very, very good. We are obsessed with these! Made a perfect pre-Halloween lunch with boo-tato salad, and a mix of bitter greens, perfectly ripe pear, goat cheese and pumpkin pie spice candied almonds. So much fun, as you can see here and here and here. We have a wee crazy thing for all things Polynesian circa 1950. Saute onion in butter until golden brown. Stir in peanut butter. When melted, add the tabasco, salt and pepper. Stir well. Bring to a boil the half cup of pineapple juice. Stir in the brown sugar, ketchup and soy sauce. Simmer. Stir in cornstarch mixed with 1 or 2 tablespoons of pineapple juice. Boil and stir well. Thread steak slices onto skewers. Place carefully into plastic bag. 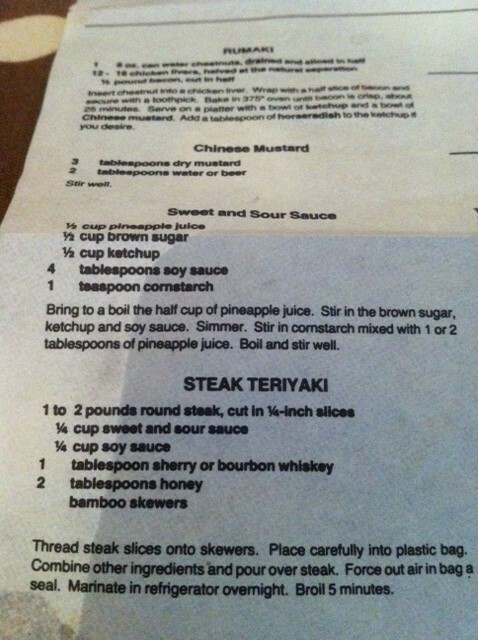 Combine other ingredients and pour over steak. Force out air in bag and seal. Marinate in refrigerator overnight. Broil 5 minutes. Trim the fat from the steak and with a sharp knife cut it almost in half horizontally. Open it up and spread it flat, so that it resembles a butterfly with open wings. Pound to flatten a little and sprinkle with the MSG. Rub 1/4 teaspoon freshly ground pepper and 1 tablespoon cognac into meat and let stand about 15 minutes. Place under hot broiler or grill, and cook 3 minutes per side for rare. Place on a hot platter and keep warm. In the top of a chafing dish put: 1 teaspoon Worcestershire sauce, 1 teaspoon Dijon mustard, 3/4 cup beef stock, 1/2 teaspoon salt, dash of pepper, dash of bottled steak sauce, dash of chili sauce. Stir and cook until sauce bubbles. Put steak in chafing dish and spoon sauce over it. Heat 1 jigger of cognac and pour, flaming, over the steak.